I want to start off by saying that this book was hilarious! I loved the main character, Emma, and I really felt a strong connection to her. Not only is she smart, funny and a bit snarky as well. It was so much fun to read this book through Emma’s eyes. I love her character! We really see her grow more confident with herself throughout the book, especially after she meets Galen. Ah, Galen. He was such an interesting character. I also enjoyed watching the relationship grow between him and Emma. They were so very sweet together. (Well, most of the time!) I also enjoyed reading some of the chapters from his perspective as well. The secondary characters in the book were so much fun as well! I enjoyed Rayna, Galen’s brother, and Toraf, Galen’s best friend. The only character that I couldn’t quite figure out was Emma’s mom. She was very mysterious, and I was quite curious about her story. This book starts off with a bang and just keeps going! The storyline was interesting enough to keep me turning the pages, and the pacing flowed perfectly. I love the idea of mermaids and mermen (called Syrena). I haven’t read many, if any books, that deal with mermaids, and I found it to be extremely delightful. The ending definitely left me hanging, and I’m really curious to see what is going to happen next! Overall, I really enjoyed this book more than I expected to. It was a great read for this summer, and I’m glad I read outside by the pool. It was a perfect setting for this beach read. I can’t wait to get my hands on the next book! So glad you enjoyed this! I agree with everything you said. I loved the humour and the wonderful characters. Anna's story was engaging from beginning to end, which is why it's definitely one of my favourites this year ;) I was addicted! <3 Great review! I've seen so many reviews of this that are really positive and really negative and I can't mak eup my mind whether to read it or not! 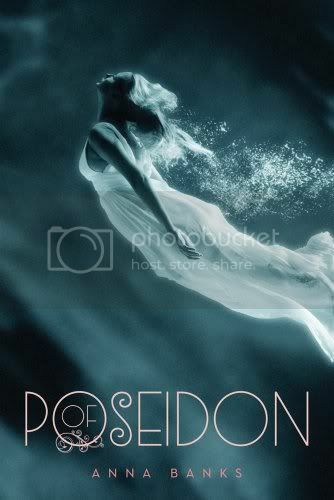 I don't usually read mermaid books and I do want to start, maybe this one would be best? I thought this book was hilarious! It's definitely a great summer read! Love the review! OOh nice review! I cannot wait to read this one either! Just have to finish my review book pile than I can finally read all the books I've been buying like crazy!! Glad to hear that this was an awesome Mermaid read!! Another really good one is Tracey Deeb's Tempest Rising and Tempest Unleashed--that one releases next week, but my review of that is up now if you were curious! I'm so excited to read this! I won it an giveaway not long ago. Awesome review! I am sooooo happy you loved this one so much!!! This was one my my favorite reads this year and I'm always giddy with excitement when I hear that someone enjoyed it so much! Galen.. oh boy we was awesome right???? I love the funny note and the endless batter between Galen and Emma! :-) Glad you enjoyed it! I have an ARC of this book, but couldn't decide if I wanted to read it or not. Now I know that I do! Thanks for the great review. I am so excited to read it now.